You did it! 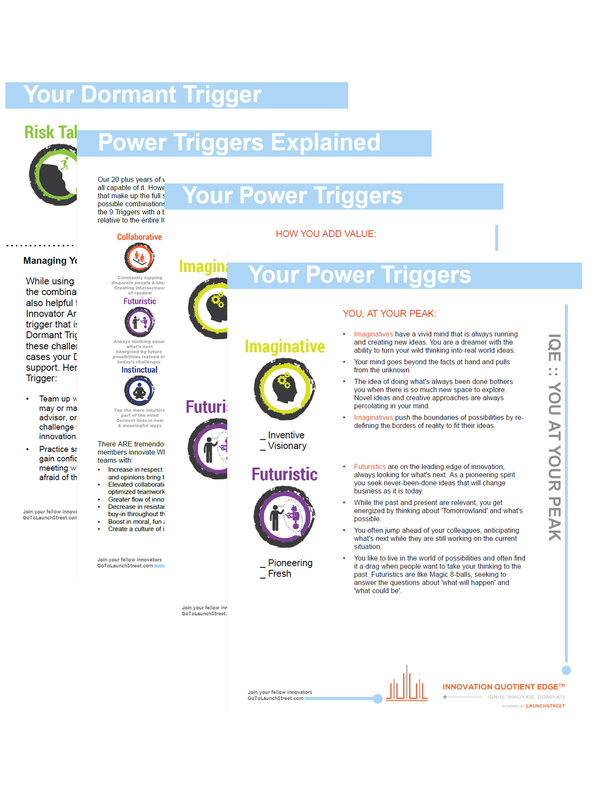 You took the first step in unlocking your Innovator Archetype by taking the assessment. Now you are ready to take it to the finish line and unleash your greatest innovation superpowers into the world!! I'm so honored and proud you'll be joining the hundreds of thousands of everyday innovator across the globe. People like you and me, unleashing our unique style of innovation and highest value into our lives and worlds. Imagine the impact we are all having together! Congrats on being a part of that impact. Your unique Innovator Archetype, including your Two Power Triggers. Your Dormant Trigger that may be slowing you down - and how to manage it. A deep description on how you perform at your peak and add value. How to tap into your greatest competitive advantage - your innovative mind. Tools for using innovation as your competitive edge. Methods on how to be innovative, on demand. If you haven't completed the full assessment online yet, you'll receive a link to take that first step. If you have, your complete report and innovation advantage will be on its way to your inbox shortly. PS - if you purchase your report and don't receive it within 10 minutes, email us at team@gotolaunchstreet.com. Every now and again the mysterious spam filters like to hold it hostage, especially at large companies.